The house stands on low ground, under the shadow of a large Hill built by Mr. Frank about 1830, and at the same time a new front was made to the hall. A few ashlar stones, a portion of the Chimney, the cellars, and date-stone E.K. (Elizabeth Kynaston) 1714, are all that remain, older than the 19th. century. A short drive up to the house conveyed, over the road, by a bridge, was disused about 1850 and the bridge removed. Elizabeth Kynaston d. & h. of William Kynaston of Maesbury Hall married in 1700 Thomas, nephew and h. of Thomas Kynaston of Melverley Hall. On the death without issue of Thomas, son of this marriage, in 1763, the estate passed by his will to his nephew Revd. Thos. Barrett, rector of Hordley. son of Vaughan Barrett, and Mary Kynaston: from him, it passed to his sister Letitia, who dying unmarried. in 1802. left it to her cousin (through the Vaughans) Col. Edw. Disbrowe. In 1820 Sir Edw. Disbrowe, son of the above, sold the estate to Mr Frank, who afterwards sold it to Mr. Peate. 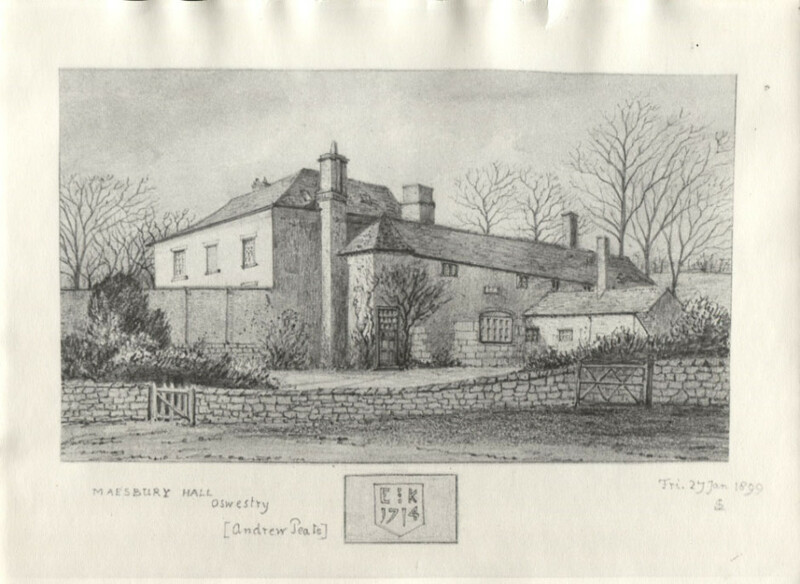 The two properties of Melverley and Maesbury were about 600 acres. These Kynastons were a branch of the Kynastons of Hardwicke and Hordley.